Grognards in action; Bill Thomson vs Marty Musella The latter won his third Waterloo title and then announced his "retirement". Yeah, him, Rob Beyma and Roger Clemens. Election Central? 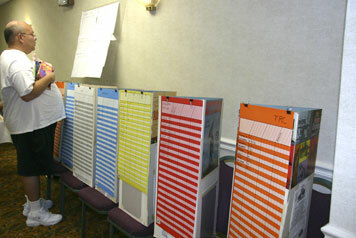 No ... just the up-to-date scoring for the Grognard games to determine who will make the Single Elimination playoffs. Waterloo's resurgence continued this year with 22 contenders to the imperial throne, the most players ever. 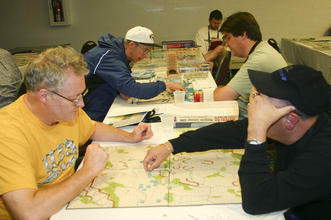 While this game has prospered in the GrognardCon pre-convention, eight players still joined the tournament during the regular convention. 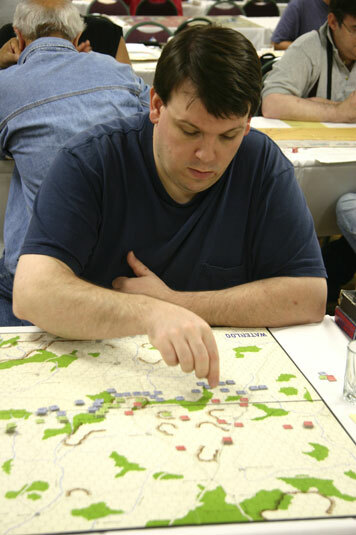 Also once again, several players were returnees from younger days when they joined the hobby and Waterloo was one of the few games available. What was even more encouraging were the three youngsters giving the game a go for the very first time. Not too shabby for a game that is older than more than half of the contestants. After the smoke had drifted away from the preliminary skirmishes, the four semi-finalists were Jim "Attack, Attack" Tracey against Richard "Beyma the Younger" and Bill "The Hammer" Morse versus Marty "Mad Marine" Musella. In the first semi-final, Jim's French wasted no time and launched their main assault immediately down the primary roads towards Quatre Bras with a single flanking attack towards Nivelles. Richard adroitly delayed the main attack and concentrated his PAA forces in front of Nivelles. Despite being outnumbered in this sector, Jim's French gallantly advanced and in a tangle of thrusts and counter-thrusts in the woods, traded counter for counter with Richard's PAA. This slugfest continued for several turns until the French numbers dwindled and Jim was eventually forced to go on the defensive. Meanwhile, Richard's PAA conducted a fighting withdrawal through Quatre Bras contesting every French assault. Richard then re-concentrated his victorious Nivelles forces and slowly withdrew the PAA to doubled positions around Genappe and in the ridges in the center of the board. At this stage late on 17 June, both armies were at about the same strength and the game was still up for grabs. Would French maneuver at this point replace the elan and blood of French bayonets? Jim decided that the only marching the French would do would be straight at the PAA, so true to his nom de guerre, he doggedly assaulted into the heavily defended ridges. Even though he captured one ridge, Jim suffered several crippling exchanges that bled the French Army to death. When Richard's PAA counterattacked and pinned several divisions against a river with no retreat, Jim realized he was on his way to exile on St. Helena. Bill and Marty had met before in competitive play and Bill's increased tactical skill was evident in this semi-final as his French advance featured the "traditional" three pronged advance towards Nivelles, Quatre Bras, and Wavre. This French opening stretches the outnumbered PAA and seems to be a more successful strategy then a "high diddle diddle, right up the middle" immediate assault. Bill immediately put pressure on Marty's PAA and the center thrust made good progress towards Quatre Bras. Bill's Nivelles force was quickly countered by Prussians from the center and arriving British reinforcements as Marty tried to obtain force superiority in numbers. Bill's French tried to force their way down the main road towards Nivelles all afternoon on 16 June and the morning of 17 June. The combat was extremely bloody with exchanges suffered by both players in almost all attacks. Marty's superior numbers finally carried the field and forced Bill's French column to a halt far short of their Nivelles objective. On the French right flank, Bill's force consisted of a small force of French cavalry with two supporting infantry divisions in an attempt to extend the PAA defenses along the Dyle River towards Wavre. When Bill concentrated his force to force the upper Dyle attempting to get behind the PAA at Quatre Bras, Marty's screening forces surrounded and attacked. He also dispatched three large Prussian infantry divisions from the center to form a second echelon assault. In three game turns, Bill's French force had been crushed on the river and now the PAA forces from both flanks were converging on the center to confront the French advancing from Quatre Bras. Throughout 18 June Bill's French slowly forced the PAA back towards Waterloo trading board space for time looking for the Prussians. The arrival of the Prussian IV Corps, mimicking history, brought an end to Bill's imperial ambitions in what turned out to be the deciding game for the "wood". A promising championship game between Marty and Richard never occurred since Richard swore allegiance to the Czar in the Napoleonic Wars Final but promisied he would return to seek glory next year. Marty announced that he will retire from future competition, though continue to teach and GM Waterloo next year. Early intelligence reports also indicate that former champion, Rob "Napoleon" Beyma (recently nicknamed "Beyma the Elder") will return next year, so a father-son grudge match may be possible in this well-balanced game of maneuver. Stop by next year as the GM has promised to reveal his Waterloo "secrets of play" so that even the newcomers might find "a Marshal's baton in their knapsack"!